Allocortex is a part of the cerebral cortex characterized by fewer cell layers than the neocortex, which is also known as heterogenetic cortex. It is characterized by having just three or four cell layers, in contrast with the six layers of the neocortex, and takes up a much smaller area than the neocortex. The specific regions of the brain normally described as part of the allocortex are: the olfactory cortex, which mediates olfaction, the hippocampus, which mediates limbic input. Allocortex is heterogenetic cortex, because during development it never has the six-layered architecture of homogenetic neocortex. Allocortex has just three or four layers of neuronal cell bodies in contrast to the six layers of the neocortex. There are three subtypes of allocortex, the paleocortex, archicortex and periallocortex. The hippocampal formation comprises the dentate gyrus, Ammon’s horn (CA fields), and the subiculum. The dentate gyrus and the CA fields each have a prominent single layer of neurones, with an overlying molecular layer and a subjacent polymorphic layer. 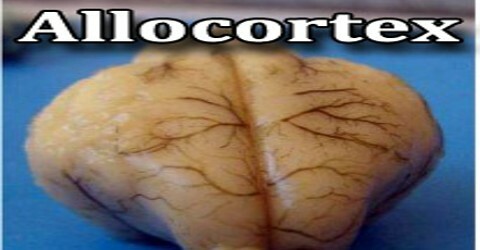 Paleocortex is a type of thin, primitive cortical tissue that consists of three cortical laminae (layers of neuronal cell bodies). The two granular layers II and IV of neocortex are absent in paleocortex. The main areas of paleocortex are the olfactory bulb, olfactory tubercle and piriform cortex. Archicortex is a type of cortical tissue that consists of four laminae, layers of neuronal cell bodies. The main areas of archicortex are the hippocampus and dentate gyrus. 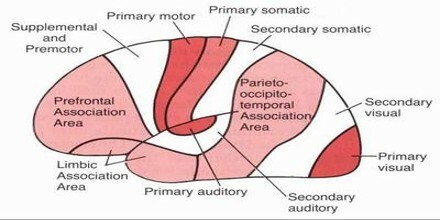 The subiculum is the zone of transition between the three-layered hippocampus proper, and the entorhinal cortex and cortex of the parahippocampal gyrus laterally. It is sometimes further subdivided into subzones including the presubiculum, between the lateral cortex and the subiculum, and the prosubiculum. 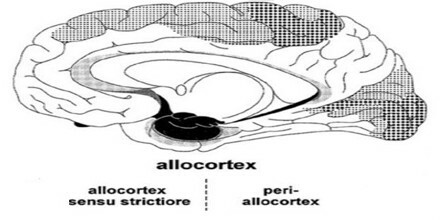 Periallocortex is a transitional form between neocortex and either paleo- or archi-cortex. It thus can be either peripaleocortex (anterior insular cortex) or periarchicortex, entorhinal cortex, presubicular cortex, retrosplenial, supracallosal, and subgenual areas. There is a general principle in the organization of connectivity with the cerebral cortex of overlapping connectivity of functionally related areas throughout the range of connections made. In other words, functionally related cortical areas, which are connected with each other, also tend to have overlapping or interdigitating connections with other structures. This is seen on the striatum, the thalamus, the claustrum, the cholinergic basal forebrain, and the pontine nuclei.